First thing is first: there must be ground rules when going out to sample possible fragrances. When you try on cologne, smell a maximum of five of them; more than that is too much. The vase of coffee beans that the store has available to cleanse your nasal palate doesn't always work very well, so you want to keep things simple and not overwhelm your nose. The next rule is that you want to make sure you actually try on the scents about which you're most serious. Also, only try on two scents at a time, preferably on a per-day basis. (Most people don't want to go home and shower and change clothes just so that they can go back to the store and try on a new scent.) It's best to keep your purchasing to a multiple-day schedule. Try a new cologne one day and if you really like it, go back to the store and buy the new scent the next day when you're sure it doesn't do anything weird after wearing it for a few hours. There are three basic scents to any perfume or cologne. 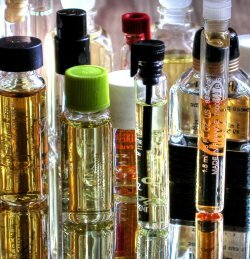 When you go to select your cologne, the initial scent you smell is not the scent that you will carry with you all day long as you wear the cologne. Within 10 minutes to an hour of putting on the cologne, the first scent will evaporate and you will find that a new, second scent develops as the cologne interacts with the chemistry of your body. Thus, it is important that when you go to the store to try on cologne that you give it time to marry itself to your body oils so you know what you're really getting into when you buy and wear it. Place the scent somewhere you can easily smell it at a close distance and where it won't be rubbed or washed off, like the insides of your elbows. Don't rub in the scent, as this will change the smell from what it would otherwise become. This second-stage scent that makes itself known will be what is called the "heart" scent, and is what will be the main fragrance for which your perfume will be remembered. Give it about four hours to really develop on your skin. After the "heart" scent evaporates, the third and final scent that will be left will be the "base note" and is less intense, but a more lingering and full-bodied scent.